On National Pizza Day, and all of the other 364 days of the year, people across this country settle for sad slices of pizza that were once frozen solid like a manhole cover, lacking toppings or damaged in delivery. They often look nothing like the picture above and sometimes taste like cardboard. Let’s face it, not all pizzas are created equal. Sure, you can always add more cheese to take it to the next level, but you might be surprised how trying different types of cheese can improve an otherwise boring pizza. While some scientists claim that mozzarella and cheddar are the best mix, there’s also provolone, Gouda, Colby, Edam, Asiago, Gruyère, Emmental, bleu, ricotta, burrata – and you’ll probably want to top it off with some Parmesan. So you ordered a basic cheese or one topping pizza? Add pre-cooked vegetables for extra flavor and extra nutrition. Beyond popular favorites like garlic, peppers, onions, olives and mushrooms, have you tried zucchini, corn, cauliflower, kale, quinoa, squash, broccoli or spinach? And don’t forget about fruits! Besides pineapple, some use peaches, pears, apples, bananas and fig. Dips aren’t just for chips. Sometimes the easiest way to jazz up a bland slice isn’t in the slice itself. Some swear by ranch dressing, but depending on the flavor of the slice you can also go with marinara, garlic and herb, pesto, BBQ, buffalo or hummus. Some even dip their pizza in milk. We’re not making this up … it’s a thing. This one isn’t for everyone, but for those who like their pizza hot and spicy, you don’t have to settle for that packet of dried red peppers. There’s Tabasco, Sriracha, Cholula (everybody has their favorites), and if that’s not enough, you can add peppers ranging from hot to ‘you might need to sign a waiver’ before you eat it. Promote your small time pizza to the big leagues by cooking it on a pizza stone. You can make your own with a few bucks at a home improvement store. Look for untreated, unglazed terra cotta or quarry tiles. They’ll distribute the heat more evenly in your oven or barbeque. Yes you read that right, you can cook a pizza on a barbeque. Coat the crust with olive oil before you stick the pizza in the oven. You can also use melted butter, garlic powder, crushed garlic, oregano, and some grated parmesan cheese. This simple step can add a seasoned and flavorful boost to any premade pizza. We’re not just talking about sprinkling some bacon bits on top, not that there’s anything wrong with that. Try adding some new combos like peaches and prosciutto, blackberries and basil, even shrimp and lobster. There’s plenty of inspiration online … alongside pizzas with hardboiled eggs, Flamin’ Hot Cheetos, spaghetti and ramen noodles. There are a lot of ways to cook pizza that don’t even look like pizza. For example, put a pizza upside down on another pizza with cheese in the middle and you have a grilled cheese pizza/calzone impersonator. Go a stack higher for pizza lasagna. Roll a mozzarella stick inside slices or cut strips of ‘pizza fries.’ Kids like slices cooked on a stick like a Popsicle or heated in a waffle iron. There’s an art to reheating slices. Using an oven, preheat to 375 and put it on a hot baking tray, cookie sheet or foil for 10 minutes. Or put it in a skillet, covered on medium heat with a few drops of water in the pan, and cook for at least five minutes. Then there’s the microwave – just place a cup of water next to the pizza when you cook it. Hopefully one or more of these pizza hacks will help you elevate your next pizza from disappointing to delectable. If you’re still not impressed, try getting the ingredients to make your own pizza the next time you’re at the grocery store. It’s pretty easy with enough time and the right ingredients. Bon appétit! There are plenty of reasons to love February. Sure, there’s Valentine’s Day and Oregon’s birthday for becoming a state, but have you heard of the month-long effort to fight hunger known as “The Melt Down?” If you like grilled cheese sandwiches, you’ll love what you’re about to read. During the entire month of February, 20 restaurants in Amity, Carlton, Dayton, Dundee, McMinnville and Newberg are selling their own special grilled cheese sandwiches in a friendly competition for the title of the “Biggest Cheese.” Everyone ends up a winner though, since all grilled cheese sandwiches sold during the month of February raise funds for the Yamhill Community Action Partnership (YCAP) regional food bank. This year’s goal is $20,000. As part of the Oregon Food Bank network, YCAP provides food to 17 emergency food pantries strategically located throughout Yamhill County. These pantries provide a variety of fresh and shelf-stable groceries to low-income families and individuals. YCAP also provides food to six meal sites in the county. From a prior year, this is just one of many tasty examples from The Melt Down. In the spirit of friendly competition, The Melt Down chefs are using some serious creativity with their culinary creations, including special cheeses, sauces, breads and other tasty surprises. As the Yamhill Valley News-Register reported, “These are not your father’s grilled cheese sandwiches.” Many local cheeses and dairy ingredients are featured on the menus. Through the Oregon Dairy and Nutrition Council, Oregon dairy farmers and processors are supporting The Melt Down in 2019 alongside ongoing nutrition and food security initiatives. There are also plans to involve Oregon Dairy Princess-Ambassadors, local dairy farmers and Undeniably Dairy materials in related events and communications. There’s a passport available for those adventurous souls who seek to experience all 20 offerings throughout the course of the month. But just remember, there are only 28 days in February, and if you want to try them all, the clock is ticking … good luck! What do you get when you combine a fun and informative creamery tour with dairy farmers and princesses, and top it off with delicious cheese samples and ice cream? At the special Oregon Dairy Day event at Tillamook Creamery on October 20, you got 200 very excited Girl Scouts and family members. They were there to be among the first-ever to earn the new “Oregon Dairy” patch. 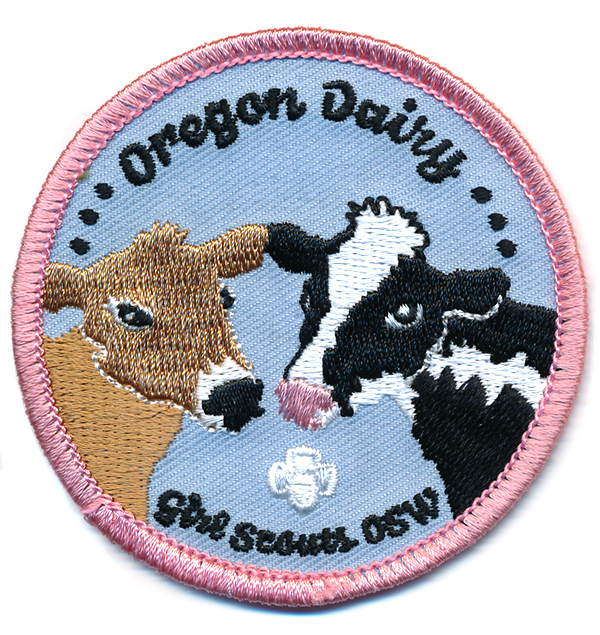 Girl Scouts of Oregon and Southwest Washington, in partnership with the Tillamook County Creamery Association and Oregon Dairy and Nutrition Council, designed this new patch program to educate girls about STEM concepts, farms and food production, and the Oregon dairy industry. The patch program encourages Girl Scouts to learn through five hands-on steps: visit a dairy farm, discover how milk is transformed into dairy products, explore dairy nutrition, and learn about careers in the industry, from dairy farmer to food scientist to food marketer. The program concludes with a taste test. Volunteers from the Tillamook staff, along with the Oregon Dairy Princess Ambassadors, hosted interactive stations at the Tillamook Creamery Farm Experience Center to help the Girl Scouts earn their patch. Girl Scouts also visited a station focused on nutrition and balanced diets. Oregon Dairy Princess Ambassador First Alternate Megan Sprute explained how and why milk is a good source of calcium, nutrients, and vitamins. To learn about different careers in the industry, the Girl Scouts conducted food science experiments, creating their very own yogurt flavor, complete with a variety of toppings (including edible glitter sprinkles)! They were also able to visit with a veterinarian to learn about cow care and a scientist to learn how to use a microscope to look for bacteria. The dairy scientist explained that all bad bacteria is kept out of milk. The Girl Scouts finished their patch requirements by taking a tour of the Tillamook Creamery, where they watched the milk turn into cheese and the employees prepare packages for shipment. And of course, they were able to taste test samples of delicious Tillamook cheese and ice cream. Bring friends together with this cheesy dip. Dietitian’s Tip: A fun way to get calcium, protein and whole grains. Place cream cheese and cheddar cheese in a food processor and blend until smooth. Add yogurt and milk. Puree again until smooth. Transfer dip to a serving bowl. Serve with whole grain crackers. On the 21st of August, individuals from all over the world, including Asia, Europe and South America stopped in Tillamook to tour a dairy and the Tillamook Creamery. It was just one stop on a tour of Oregon’s diverse agriculture as twenty-one locally employed staff supporting the USDA’s Agricultural Trade Offices at American embassies and consulates traveled the Oregon coast. Their first stop on this week-long tour of American export opportunities was in Washington DC for tours, trainings, and meetings with the USDA. On Saturday they flew from Washington DC to Oregon. And Sunday, they began exploring everything Oregon grown, from pears to blueberries, barley and hazelnuts, to seafood and dairy. At Oldenkamp Farms, tour guests were able to see robotic milking and automated feeding in action. The Lely feeding system is one of only four of its kind currently in the U.S., affectionately named by the Oldenkamp Family after Dr. Seuss’ “Thing 1 and Thing 2”. After a visit with the cows and farm family that produce some of the milk for Tillamook cheese, the group of internationals continued on to the Tillamook Creamery Visitor’s Center for a self-guided tour and lunch. “This is the best cheese I have ever tasted,” said Annie Qiao, Marketing Specialist for the Agricultural Trade Office in Shanghai. Annie explained that current trends in Shanghai for exports are focused on American foods for ingredients in Chinese meals. “For those companies that are interested and ready [to export], the world is open for American products. And the world is really open for Oregon products” said Lane. Food Hero has a wealth of easy to make, nutritious recipes to liven up your summer days. Here is an easy summer lunch idea for the kids … or yourself. Dietitian’s Tip: This recipe is a great addition to a healthy diet serving up dairy protein, fruit, vegetables, and whole grains. Come up with your own combination using different fruits and vegetables. Lay two tortillas on two plates. Divide the cheese between the two tortillas. Divide the pears, peppers, and onion between the two tortillas. Top with remaining two tortillas. Heat a skillet or griddle to medium (300 degrees in an electric skillet). Place one quesadilla in pan. Cook 2-4 minutes, or until bottom of quesadilla begins to look a little brown. With large spatula, gently turn the quesadilla over and cook the other side until a little brown, 2-4 minutes. Gently slide quesadilla onto a plate. Cook the second quesadilla. Cut each cooked quesadilla into 4 pieces and serve. This week, a group of 13 aspiring chefs from Oregon Culinary Institute took a closer look at where cheese comes from by taking a field trip to the source. They visited TMK Farm and Creamery, a 20 cow dairy and boutique creamery located in Canby, Oregon. Between milking cows and making cheese, it was truly an opportunity for hands-on learning. TMK Creamery hosted a cheese making class where students were able to join in the entire process of making queso fresco cheese. Queso fresco, which translates as “fresh cheese,” is the most widely used cheese in Mexican cooking. From cutting the curds, draining the whey and actually milking the cow, all the steps were included. Education is the goal for TMK. They want students, especially in the culinary world to understand not only the process, but also the passion behind their artisan cheese. Score Points with this Super Artichoke Dip. Word on the street is there’s going to be a pretty big football game televised this Sunday. One might even call it “super,” with the express written consent of the National Football League, of course. No plan yet for your big game watch party? Kick it off with this artichoke dip that’s sure to score points with your guests. It’ll be super in a bowl, or on a plate, and will stand apart in a crowded field of game day snacks and appetizers. Mix ingredients together. Cover and refrigerate a couple hours before serving. Follow the link to LiveBest for directions to strain plain yogurt.